Blenheim Palace and the neighbouring market town of Woodstock, in the county of Oxfordshire, are set in lyrical countryside typifying the quintessential English rural scene with sheep pastures, wooded valleys, dry stone walls and weathered Cotswold stone buildings. In villages like Woodstock it is still possible to imagine life in the Middle Ages, so timeless do they seem. Woodstock has had royal connections going right back to Saxon times. At the beginning of the 12th century King Henry I built a residence and kept an exotic menagerie here. His grandson, King Henry II, enlarged the royal manor and visited it with his mistress, the Fair Rosamund. The legendary Black Prince, eldest son of King Edward III was born at Woodstock Manor in 1330 and it remained as a royal residence until besieged and badly damaged in the English Civil Wars. At the beginning of the 18th century Queen Anne gave the manor and estate to John Churchill, first Duke of Marlborough, in gratitude for victories he had won, particularly at Blenheim on the River Danube, against the French and Bavarian armies. Not only was he given the estate, the Queen also promised to pay for the building of a new house on the site. The architect for the house was Sir John Vanbrugh and building started in 1705. John Churchill was married to Sarah who was a lady-in-waiting to the Queen, a position that enabled her to keep Queen Anne to her promise to finance the building. However, in 1710 she fell from royal favour and the money stopped. By 1712 all work on the house had ceased and only restarted two years later. It seems that Sarah Churchill was a difficult character and she had numerous disputes with Vanbrugh who resigned in 1716. The Duke of Marlborough died in 1722 but Sarah continued with the work on Blenheim Palace for the remaining 22 years of her life, seeing it as a tribute to her husband. Blenheim Palace, set in a 2500 acre park that was redesigned later in the 18th century by Capability Brown, has been described as a masterpiece of Vanbrugh's work. It has magnificent room, the most celebrated of which is the Long Library, originally designed as a picture gallery. The Battle of Blenheim is commemorated in a ceiling painting in the Great Hall and again in the Green Writing Room. There are also portraits of the indomitable Sarah Churchill without whom the palace would possibly never have been completed. The huge and ponderous palace, with its porticos, pillars, pinnacles and towers, represented to many a monstrous, medieval fortress. Alexander Pope shared this opinion of the sheer massiveness of its stone facade and wrote the following witty epitaph for Sir John Vanbrugh on his death. Laid many a heavy load on thee." Thanks, Sir, cried I, 'tis very fine, But where d'ye sleep and where d'ye dine? I find by all you have been telling, That ‘tis a house but not a dwelling’ - Alexander Pope's question after a visit to Blenheim Palace. Video on Preserving our Great Estate... from Blenheim Palace on Vimeo. Sir Winston Churchill. He was born there on 30th November, 1874. Although the dukedom passed to his cousin, he apparently was very attached to the place. He proposed to his future wife Clementine beside the lake in the Temple of Diana. When he died in 1965, his wish was to be buried in nearby Bladon Churchyard alongside his parents. Twelve years later his wife Clementine was laid beside him. 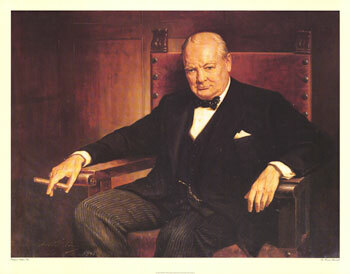 Visitors to Blenheim Palace can see the room where Churchill was born and also an Exhibition of his life and work including a bronze of Sir Winston and his wife, a painting by Churchill of the Palace, letters and photographs. 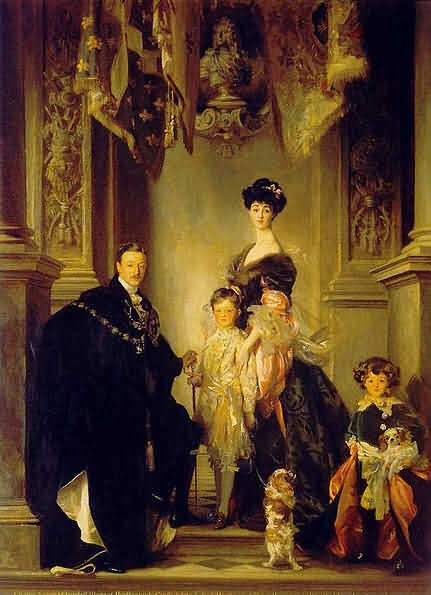 John Singer Sargent in 1905 painted the 9th Duke of Marlborough and his wife Consuelo Vanderbilt with their two sons, the Marquess of Blandford and Lord Ivor Spencer-Churchill. Few portraits could be more steeped in British and American history. Not only are the individuals scions of two of the most notable British and American families, but it illustrates a fascinating development in the late 19th century of wealthy American heiresses marrying wealthy English aristocrats. The 9th Duke here is rather a non-entity, but Consuelo and her mother Alva (not pictured) were fascinating individuals. The painting hangs in the red drawing room at Blenheim Palace. The duke was nicknamed 'Sunny'. He wears his robes of the Order of the Garter, the most prestious order of knighthood in England. 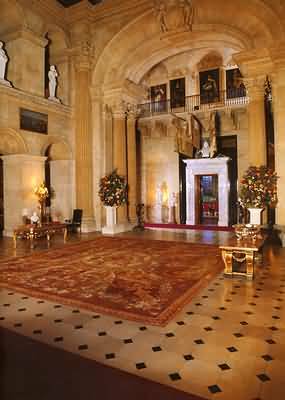 At the centre top is the bust of the first Duke between the tapestry or flags. Consuelo Vanderbilt (1877-1964) was married to the Duke on 6 November 1895 (giving her the title of Duchess of Marlborough) and was Winston Churchill's cousin by marriage. At the time of the marriage the duke was 23 and the wedding took place at St. Thomas Church on Fifth Avenue in the most prestigious Gilded Age wedding. Her father gave the Duke $2.5 million, which he desperately needed to make repairs and renovations to Blenheim Palace. Woodstock is an ideal base for visits to Oxford and the North Oxfordshire Cotswolds.